Must not involve actual pumpkins. Well, ok…if the world’s most perfect pumpkin muffin involved real pumpkins, I’d still make it. However, let’s be honest: pumpkins, unless you plan on decorating them, come in a can. No one actually wants to break down a pumpkin, just like no one wants to break down, say, a butternut squash. We do the squash because we’re probably roasting it and not pureeing it, mixing it with sugar, flour, and loads of spices and making cake out of it. So. The beginning of this year’s pumpkin-craziness came with my daughter’s first trip to the local pumpkin patch. We have a great one around here, and it’s filled with rows and rows of every sort of gourd you can imagine. They also have tons of land to run around, and that’s her favorite thing to do right now. It was a pretty productive trip: lots of pumpkins were adopted, and she taught me her secret toddler way to test for good pumpkins: sit on them. all. I guess it’s whichever one feels good. After pumpkin adoption, it was time to make muffins. I had already adopted my own cans of pumpkin puree from the store, so I was ready to go. I’ve realized over time that if you are baking and have in your mind something extremely specific as the outcome (flavor, texture, look), you won’t be happy with anything until you get that exact thing you were imagining. This has proven true in my quest for pumpkin muffins. They seem easy, right? Not so much. 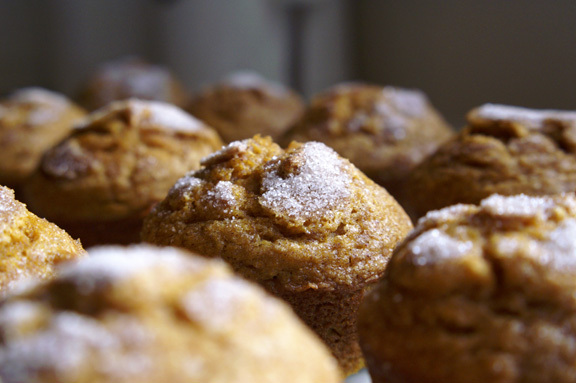 I ran through numerous recipes for pumpkin muffins and wound up disappointed every time. A few were close, but they were lacking something that made it the muffin I wanted. And then: FOUND IT! It was close enough in its original form to show real promise, and after monkeying with the second batch, it happened: perfect muffins! They had it all: crazy good density, all the zing of a pumpkin pie, and a warm little cinnamon sugar topping to make it just perfect for a fall morning. 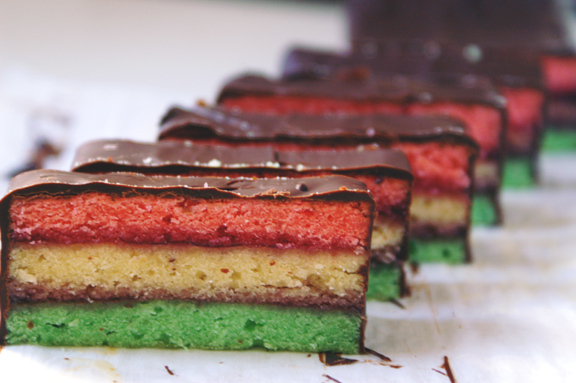 While these are in the oven, make yourself a nice cup of coffee, sit back, and wait. Half the fun of these is how they begin to smell about halfway through baking. Adapted from fellow blogger Muffin Top’s 2006 recipe for pumpkin muffins, which was taken from From Gourmet Magazine, November 2006 edition. So…there you go. Put oven rack in middle position and preheat oven toe 350˚F. Grease inside of muffin cups with butter or cooking spray (or use liners: sometimes I shy away from liners because they make a flatter muffin. Up to you). Whisk together flour, baking powder, baking soda and salt in a small bowl. 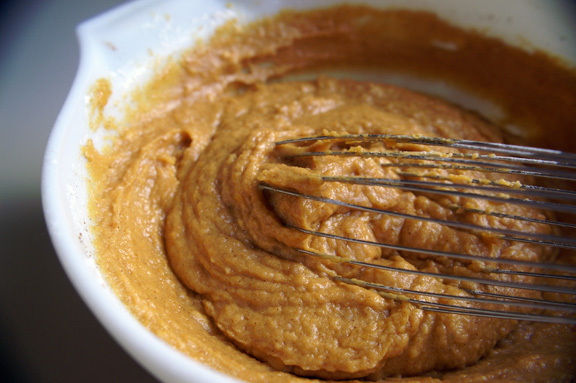 Whisk together pumpkin, oil, eggs, pumpkin-pie spice, 1 1/4 cups sugar, vanilla and 1/2 teaspoon cinnamon in a large bowl until smooth, then whisk in flour mixture until just combined. Stir together remaining 1/2 teaspoon cinnamon and remaining 1 tablespoon sugar in another bowl. Divide batter among muffin cups (each should be about 3/4 full), then spinkle tops with cinnamon-sugar mixture. Bake until puffed and golden brown and a wooden pick or skewer inserted into center of a muffin comes out clean, 20-22 minutes. DO NOT OVERBAKE THESE. You do not want a dry muffin. I suggest checking after maybe 18 minutes or so just to see how things are going. 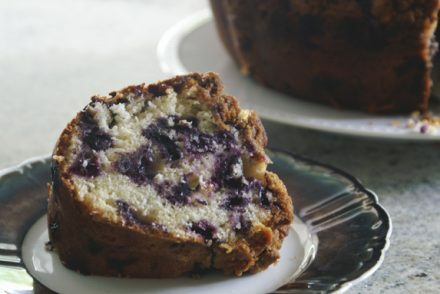 Cool in pan on a rack 5 minutes, then transfer muffins from pan to rack and cool to warm or room temperature. Eat several warm, and if anyone sees you, mumble something about needing to make sure they came out okay. 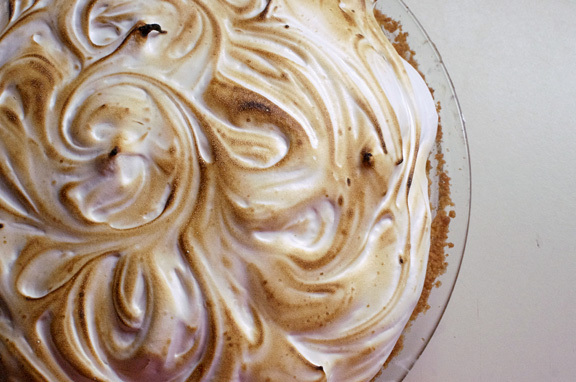 banana cream pie + toasted marshmallow fluff.